First and foremost, the medical cannabis doctor who is providing your evaluation should have an immense amount of knowledge about the benefits of medical marijuana, as well as how it can be used as a natural treatment option for a variety of severe or debilitating health conditions. He or she should also be able to answer all of your questions regarding what to expect from medical cannabis treatment (and dosages), such as the difference between THC, the psychoactive compound in medical marijuana, and CBD, its non-psychoactive counterpart. 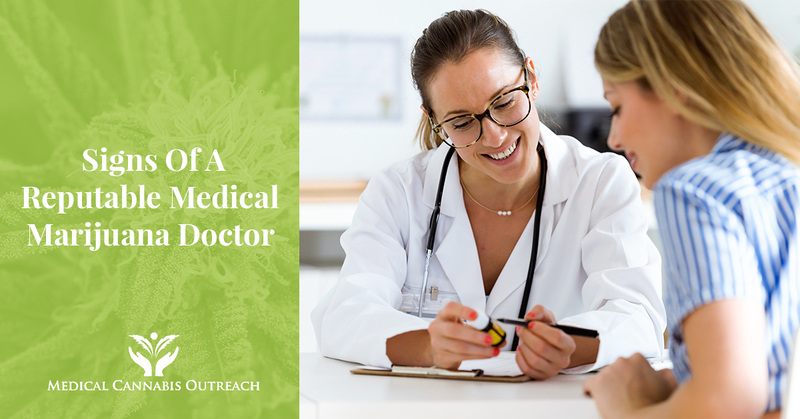 At Medical Cannabis Outreach, our physicians have a wealth of knowledge about the benefits and uses of medical cannabis and are more than happy to serve as a resource for you on your journey to wellness with medical marijuana treatment. The best medical cannabis doctors will also exhibit an awareness of state and federal laws regarding the use of medical marijuana under the Compassionate Use Of Medical Cannabis Pilot Program. Given that recreational marijuana use is still illegal in the state of Illinois, your medical marijuana doctor should demonstrate an understanding that medical cannabis is only to be used as an alternative treatment option for patients with qualifying health conditions. That being said, they should also abide by all state and federal laws with regard to the evaluation and application processes, and they should be able to communicate these guidelines to all prospective medical cannabis patients. This goes without saying — or does it? Often, medical cannabis doctors will rush through the process of evaluating prospective medical cannabis patients due to the sheer volume of people interested in applying for a medical marijuana license. If you visit a local medical cannabis clinic and are treated poorly, do yourself a favor and go somewhere else. The whole purpose of seeking evaluation for a medical card is to gain access to natural, therapeutic treatment for a health condition that is negatively impacting your life on a daily basis, and if you have to deal with a rude or unhelpful physician, this defeats the purpose. Your medical cannabis doctor should be at your service even after you’ve been approved for a medical marijuana license, so don’t settle for less than you deserve. With so many medical cannabis clinics in Illinois to choose from, be sure to choose one that has your best interests at heart and is willing to help you to the best of their ability. Another sign of the best medical marijuana doctors and physicians is that they will always be present and willing to help you at any point during your treatment period. Whether you submit a one-, two-, or three-year medical card application, you should always feel welcome at your chosen clinic. In fact, many of the best medical cannabis clinics have a team of in-house physicians, whose job is to provide ongoing patient support in addition to the initial evaluations and approvals. Visit our team at Medical Cannabis Outreach in Savoy, Wood River, Shelbyville, or any of our other locations to experience the difference of a welcoming and convenient medical cannabis clinic in Illinois. With seven medical cannabis clinics across the state of Illinois, Medical Cannabis Outreach is here to serve you on your journey to wellness with medical marijuana and CBD oil. We also hold pain management and wellness clinics, in addition to mobile wellness clinics to better suit your needs. Meet our registered nurses, clinicians, and physicians when you visit Medical Cannabis Outreach to apply for a medical cannabis card, and contact us today to learn more about our services!